For six months of 2018, Azerbaijan’s Food Products’ Procurement and Supply OJSC sold products worth 52 million manats to structures financed from the state budget, the company told Trend July 20. 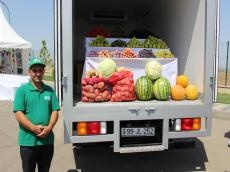 About 20,000 tons of vegetables, 3,200 tons of fruits, 1,600 tons of melons and about 4,000 tons of legumes were sold in the Azerbaijani market during this period. Export of products by the company for the mentioned period amounted to over 4 million manats. At the same time, no exports were made in June. President of Azerbaijan Ilham Aliyev signed an order establishing "Procurement and Supply of Food Products" OJSC in April 2016.